The Ministry of Education and Economic Development announced the winners of the Technology Innovation Awards [TechAwards] for 2014. “Inaugurated in 2006, TechAwards continue to prove, year after year, that not only is Bermuda an epicentre of technology and e-business in the region, but that, perhaps more importantly, it remains a global leader in technology innovation,” a spokesperson said. “This year, the TechAwards were handed out on November 20th at the Celebration of Innovation and Entrepreneurship reception which honors entrepreneurs that are active participants in the Digital Economy. “The top finisher in the International Innovation of the Year, Trunomi, is a pioneering company that has developed an online personal identity protection tool for the financial services industry. There was a tie for Local Innovation of the Year between LookBermuda’s live streaming technology for the Nonsuch Island CahowCam, and the employment match-making website, Jobber.bm. “Citing the attributes of the Local Innovation winners, the judges noted the creative use of technology developed by JeanPierre Rouja. The infrared ‘CahowCam,’ was for the first time ever being streamed live 24/7 on the Nonsuch Island website powered by solar collectors. “Incredibly enough, there was a dead heat finish with co-winner Jobber.bm, the island’s new interactive job market where one can either post jobs or look for casual jobs on the island. Website founder Stafford Lowe noted the site’s remarkable growth since its launch in April. Over 1,300 members have successfully listed over 300 jobs which, upon completion, generated over $40,000 in revenue for the contractors. “The Most Innovative Mobile Application Award was won by Gorham’s for their iOS mobile apps developed in-house by Rod Farrington. These apps allow the retailer to integrate multiple platforms, devices & data files into one focused mobile price-checking and inventory control platform. “The Most Innovative Youth Programme was judged to be BIOS’s HSBC Explorer Programme which trains M2 teachers to mentor their classes as they build underwater drone vehicles. The participating classes will take part in a competition at the National Stadium pool, which is scheduled for March 2015 As far as the People’s Choice TechAward, Five Star Home Delivery rallied their customer base to capture this contest which was run on Facebook. 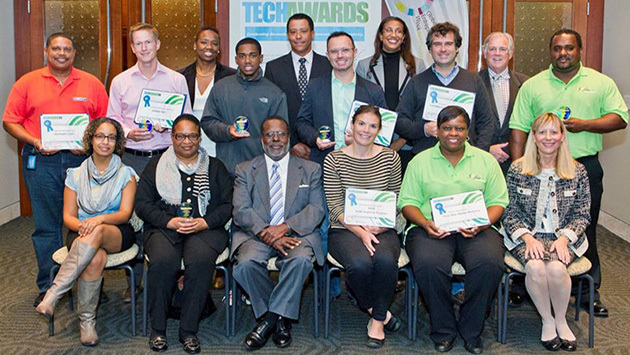 This year, the People’s Choice TechAward garnered thousands of views and votes.